We love our little cabin in Maine. 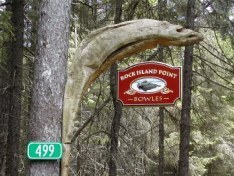 Although it's a long way from home (it takes about five hours to drive) it's a wonderful, restful place to be! The cabin is on a large lake with the melifluous name of Mooselookmeguntic. 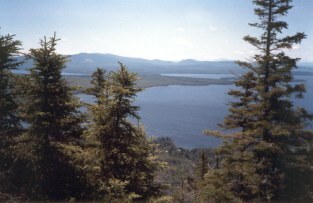 Mooselook, as most locals call it, is in the town of Rangeley in the northwest corner of the state. It's the middle lake of a chain of five lakes: Kennebago, Rangeley, Mooselookmeguntic, Richardson and Umbagog. 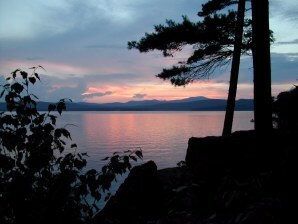 Click here or here for more information on Rangeley and the amenities you can find there. The original subdivision of the land took place in 1901, but the four parcels that comprise our property were not combined into one ownership until 1944. We are not sure when the cabin was built, but we are guessing that it happened sometime around 1920. 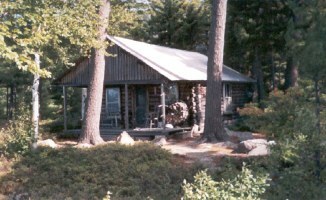 In any event, the cabin was constructed using locally harvested spruce trees and is a unique part of the history of the region. We bought the cabin and property in 1986. In the picture on the left, our property--named Rock Island Point--is the small peninsula you can see between the trees on the near side of the lake. The cabin has electricity so we have lights and heat. We also pump water from the lake for washing dishes, etc., but we get our drinking water from a local spring. The shower is elegant: it's on an outside wall of the cabin so you have a wonderful, "fully exposed" view of the lake as you bask in the warm water. Our family has thoroughly enjoyed our time at the cabin. Many friends and members of the family have visited us and we've kept a log of comments made by each visitor. It's wonderful to look back through "the red book" to re-live all those memories. Come visit when you can.